If you want to understand the evolution of sustainability and its impact on business, you should consult the expert who started the sustainability major at The Ohio State University. And he just happened to be Innovate New Albany’s TIGER Talk presenter on January 27. TIGER Talks are Innovate New Albany’s lecture series that educate entrepreneurs on the topics of Technology, Innovation, Growth, Entrepreneurship and Responsibility. Sustainability in a business context is the strategies and practices that build shareholder value, enterprise resiliency and a better world by saving energy, resources and money safely. Neil said sustainability is not to be confused with “green,” a term which is often incorrectly used interchangeably. He explained that green is the environmental component, one of the three pillars of sustainability. The other two pillars are social and economic. He said sustainability’s prerequisite is resilience, or the capability to withstand and recover from shocks. For a business to be strong over the long term, it is necessary to survive in the short term. There is continuity between sustainability and resilience, and the challenge is balancing the tradeoffs. 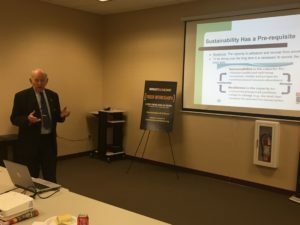 Neil explained a grid that displayed where a company may fall in its range of sustainability and resiliency, and discussed the importance of having a good balance between the two. Traditionally, compliance with sustainability had a focus on environment, health and safety at the plant level. It was driven by regulation and was tactical, not strategic. Now it’s more focused on prevention and the emergence of strategic thinking driven by the business case for sustainability. He said the strategic foundations for sustainability in business are copy nature, close loops, manage the supply chain, transparency and disclosure, and create shared value. Your grandchildren will live in a time when it will be illegal to drive a vehicle. This is because of safety, economics and efficiency in transporting goods and people. Exceptions will be made for emergency response or public service. Your grandchildren will live in a time when only a minority of the population will eat meat. Plants will become the principal source of protein in our diets, because of health, human rights and economics. For more information about sustainability and the role it plays in business, contact Neil at (614) 268-6100 or drobny_30@fisher.osu.edu.